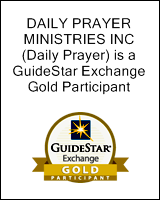 268 people in our community are currently praying with you. The great Karl Richter playing the great Toccata and Fugue in D minor by the great J.S. Bach on the great 1766 Riepp organ at Ottobeuren Monastery, Germany, is just, well, too great for words. Blessed are You, Lord our God and God of our fathers, God of Abraham, God of Isaac and God of Jacob, the great, mighty and awesome God, exalted God, who bestows bountiful kindness, who creates all things, who remembers the piety of the Saints, and who, in love, has brought a Redeemer to us, our forefathers and our children, for the sake of His Name. O Mighty King, You are a helper, a savior and a shield. You resurrect the dead; You are powerful to save us in forgiveness of our sins. You cause the dew to descend. You cause the wind to blow and the rain to fall. You sustain the living with loving kindness, support the falling, heal the sick, release the slave; You fulfill Your trust to those who sleep in the dust. Who is like You, mighty Father? And who can be compared to You, King of Peace, who defeats death and restores life, and causes deliverance to spring forth! Who is your equal, Great Comforter, who brings holiness to all who call upon You? You are holy and Your Name is holy; the angels and all the creatures of heaven and earth praise You daily for all eternity. Blessed are You Lord, the holy God. Grant, O God, that your holy and life-giving Spirit may so move every human heart, that barriers which divide us may crumble, suspicions disappear and hatreds cease; that our divisions being healed, we may live together in justice and peace; through Jesus Christ our Lord. 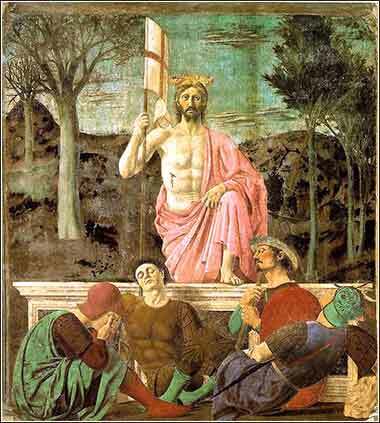 Resurrection of Christ by Piero della Francesca, c. 1463. Christ is depicted as victorious, a scruffy bleeding King with a crown of thorns. Click the photo to see it full-sized. I have been driven many times to my knees by the overwhelming conviction that I had nowhere else to go. My own wisdom, and that of all about me, seemed insufficient for the day. But in fact Christ has been raised from the dead, the firstfruits of those who have fallen asleep. For as by a man came death, by a man has come also the resurrection of the dead. For as in Adam all die, so also in Christ shall all be made alive. But each in his own order: Christ the firstfruits, then at his coming those who belong to Christ. Then comes the end, when he delivers the kingdom to God the Father after destroying every rule and every authority and power. For he must reign until he has put all his enemies under his feet. But when it says, “all things are put in subjection,” it is plain that he is excepted who put all things in subjection under him. When all things are subjected to him, then the Son himself will also be subjected to him who put all things in subjection under him, that God may be all in all. n the preceding Scripture, Paul emphasized the importance of the resurrection, which is a concept that we all grasp. But . . . what then? Christians often tend to be unclear on exactly what the Bible says about what is going to happen in the future. The five-dollar word for this is “eschatology”, which sounds intimidating but could not be more simple: it’s the theological study of what is going to happen next. We will go to sleep for a time. It does not matter how long, because it will be instantaneous as far as we are concerned. Then, Christ is going to return to the earth to judge the souls of all who have lived. Some will be consigned to a fiery hell, and some will be assigned to an eternal life of joy and peace with God the Father. Many modern churches tend to steer clear of the concept of hell. There are arguments that it does not exist or, at best, it is simply not mentioned. But Christ himself talks about it often, and the image of hell being “fiery” actually seems to originate with Jesus, the first being Matthew 5:22. But of all concepts in Christianity, the Trinity seems to be the most misunderstood. Of course, we are probably simply not capable of understanding God, and possibly the difficulty of understanding the inter-relationship of the Father, Son, and Holy Spirit is an aspect of our limitations. But, as Paul makes plain in this passage, Jesus and God the Father are two different persons. It is hard to miss this point when you read through one of the Gospels, as Jesus repeatedly speaks of God the Father with reverence and submission. After his resurrection, however, Christ was made to rule over the earth. Christ will be subject to the Father. We must realize that Christ, unlike us, has no resentment about being subject to God the Father. The concepts of ego, ambition, rebelliousness and such, simply do not exist for him. He does not “accept” his submission; he is not resigned to it. The concept is simply absent from him, because he is perfect. And just so, we must treat our relationship to Christ. He is our friend, our God and our Savior. He loves us enough to die for us. But he is also our Lord. Our hearts must be filled with humility and sincerity if we are to find him. Matthew 10:37-38 (ESV): He who loves father or mother more than Me is not worthy of Me; and he who loves son or daughter more than Me is not worthy of Me. And he who does not take his cross and follow after Me is not worthy of Me.